If you are looking for my National Scrapbook Day post, please go HERE or just scroll down. I am really excited this week because I am hosting Sweet Melissa Sunday!!! First, I just want to say a big thank you to all the wonderful bakers in this group. They all welcomed me with open arms, always leave such sweet comments on my blog, and are a fun group of bakers. Thanks, girls!! 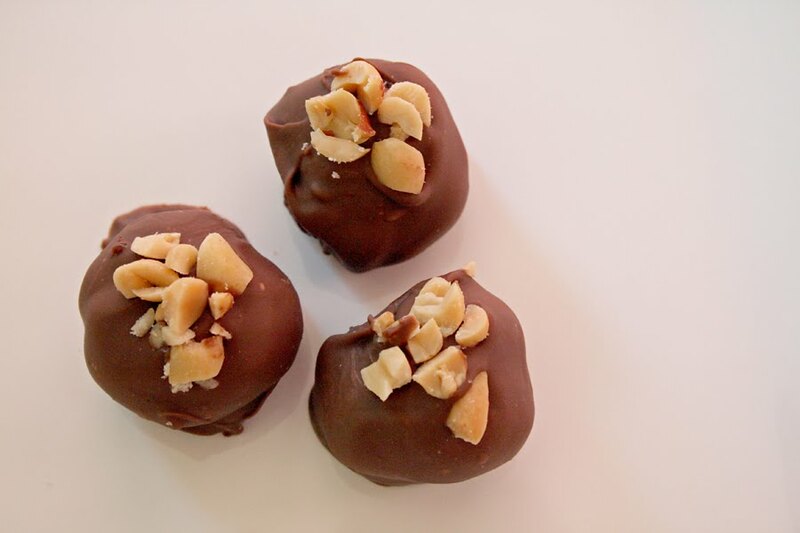 Today's recipe...Peanut Butter Truffles. I love me some peanut butter and chocolate. It's the taste combination that makes my heart sing and my taste buds dance. Seriously, I love it!! 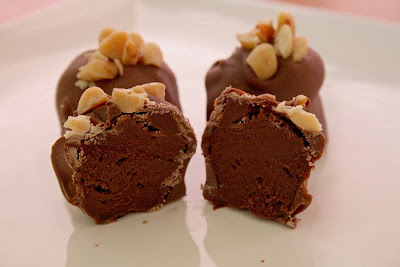 So it was an easy choice for my recipe, this peanut butter truffle. Ahhh, don't they look lonely? It's because by the time I got them photographed, there were only 3 left! I will post the Sweet Melissa recipe below, but first let me tell you what I changed. I used semi-sweet chocolate instead of bittersweet (can you believe I couldn't find any bittersweet??? Maybe I need to look harder). I refrigerated the truffle base overnight, 2-3 hours was not enough to set it. I tried rolling them in chopped peanuts, but they looked absolutely dreadful. So instead, I rolled the truffle base and then froze the balls. Then I dipped them in light cocoa candy melts and sprinkled them with chopped, salted peanuts. These were amazing. The slight crack of the chocolate coating opened up to an amazing chocolately inside. So smooth and velvety...soooo good. My only complaint was they were not peanut buttery enough. I would have like to taste the peanut butter inside more. But regardless...they were wonderful!! This is definitely a keeper recipe. Next time, with more peanut butter inside. I hope you had a great time baking these, I can't wait to check out all the SMS bakers to see what they did this week! 1. Chop the chocolate into small pieces and put in small bowl. 2. In a small saucepan over medium heat, heat the heavy cream and peanut butter while stirring to scalding, or until the cream is steaming and tiny bubbles have formed along the edges. Do not boil. Whisk until smooth. 3. Pour the hot peanut butter cream over the chocolate to cover completely. Set aside for 5 minutes, then whisk until smooth. 4. Whisk the butter to the still-warm chocolate mixture until smooth. 5. Refrigerate uncovered until the truffle base is firm enough to scoop, at least 2 hours. Using a small #100 cookie scoop or a teaspoon, scoop out the truffle base and form into bolls by rolling them around quickly in your hands. 6. Place the chopped peanuts in a shallow soup bowl. Roll each truffle in the peanuts to cover. The truffles are best eaten at room temperature. They keep refrigerated in an airtight container for up to 2 weeks. Let come to room temperature before serving. Thank you for hosting this week. 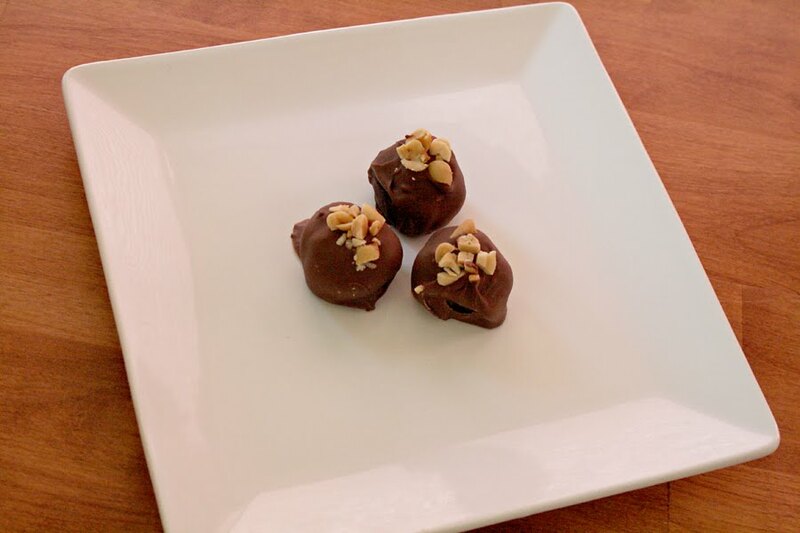 Your truffles turned out amazing! MIne don't look like yours, but I sure enjoyed the flavor! I enjoy your blog and Im so glad your a part of SMS! 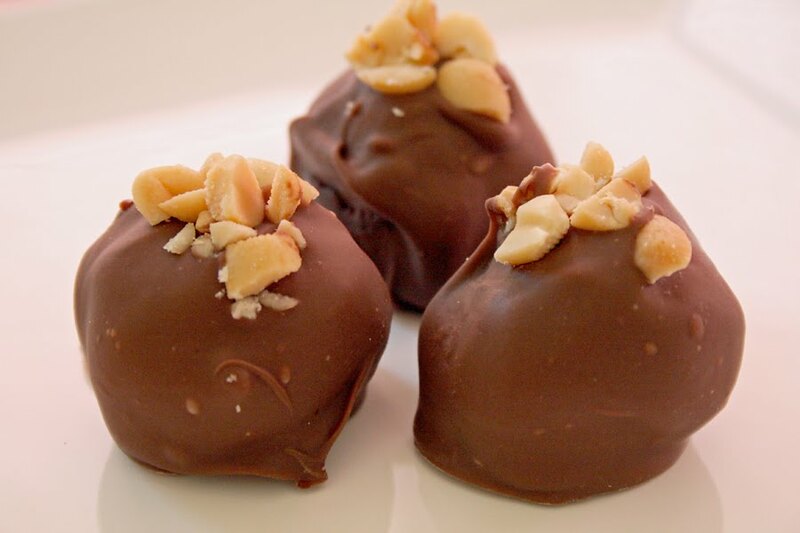 Your truffles look divine and were exactly what I had in mind when I heard we were making peanut butter truffles. I wish I had used semisweet chocolate, doubled the peanut butter, and dipped them in the chocolate. After seeing yours, I will have to give this recipe another shot! Oh yum! Love that you put the chocolate coating on them. Your truffles look delish. When I make more of these (which I definitely will) I am going to use semi sweet and try doubling the peanut butter. Thanks for the awesome pick, I didn't realize how easy these would be to make! Scrumptious!!! They look Awesome :)..Hope u have a great week!! Thanks for hosting! These were a lot of fun to make. I loved the recipe. Next time I will dip mine in chocolate - yours looks delicious! Thanks for hosting and choosing such a great recipe. I made these for my class and coated them with different sprinkles as well as the peanuts. The kids will thank you for your selection. They love chocolate. Beautiful truffles. I love the fact you dipped them! Great choice. Thanks for hosting this week! You did amazing! LOVE THEM! Hi Mara, thanks for hosting this week! Your truffles look lovely and I'm glad your selection was a hit. I think you were better off using semisweet chocolate rather than bittersweet, I usually love dark chocolate, but I didn't love it in this recipe. Thanks for choosing this tasty recipe Mara! I also used semi-sweet chocolate....after my first attempt (gone bad) I thought the bittersweet was too much. Doubling the peanut butter definitely helped emphasize that peanut butter taste. I love how you dipped yours in chocolate. They look divine! You are one busy lady! Those truffles look so yummy. Thanks so much for stopping by to say hello (and for selecting such a wonderful recipe- it certainly came at the perfect time for me!) Your truffles look beautiful- I LOVE the idea of the shell coating (it reminds me of my favorite Lindt truffles)! I will definitely give that a try next time. great pick- easy and delish! yours are so cute. I agree, would have liked more pb flavor in the truffle. thanks for hosting! This was such a great pick! I was too lazy to dip mine but it sounds like the way to go next time. I also upped the peanut butter while cutting the other ingredients in half and that helped the peanut butter flavor (as did using a lower percentage chocolate). Thank you for hosting! This was my first SMS week . . . and a great recipe to start off with! Thanks for picking a great recipe this week! I do apologize for not being able to make them, but your truffles are making my mouth water just by looking at them! Great job! Great choice, Mara! :) Love your photos! Great pick! Thanks for hosting this week. I wish I would have used semi sweet chocolate. YUM! I love truffles and those look yummy! Hi Mara! Thanks for hosting this week :) The truffles were super easy to make and for that, I also thank you! I agree about the peanut butter flavor being mild, especially with the bittersweet chocolate. I think you were wise to use semisweet. wooooow! these look soooo yummy. What's not to love? They look perfect! YUM! Is it a cookie? Or a brownie?? It's the May Crazy Daisy Kit!